The Golden Globes aired tonight on NBC and were hosted by The Tonight Show’s Jimmy Fallon. The big winner of the night was La La Land which walked away with a record 7 trophies which included Best Screenplay and Best Picture Comedy or Musical. In the TV categories, AMC’s The Night Manager surprising took the most awards (3) which included Best Limited Series or TV Movie. Atlanta and The Crown also took away big awards. Take a look at the complete list of winners. ABC has given a formal pilot order to “Libby & Malcolm,” the comedy starring Felicity Huffman and Courtney B. Vance from creators Kenya Baris and Vijal Patel. In this episode, Drew and I chat about season six of Fox’s New Girl and season three of ABC’s How To Get Away With Murder. We also discuss what we’re currently watching and what midseason series we’re looking forward to. ABC has given a full season order to new series Speechless and Designated Survivor. Speechless is one of the better comedies that arrived this fall and it has definitely paired well with the Wednesday comedy lineup it’s on that features other great series like Black-ish and Modern Family. Designated Survivor is Keifer Sutherland’s return to television after his Fox hit 24 ended a couple of years ago. Both series have done well so far in the ratings with the second weeks on air of Speechless and Designated Survivor both slipping 10% and 18% respectively from their strong starts. The series are the first new series pickups for ABC and the second for all the Broadcast networks. Speechless and Designated Survivor both air on Wednesdays and can be streamed on the ABC app and Hulu. Another Primetime Emmy telecast is in the books and the ceremony was definitely one of the funnier ones in recent history. Jimmy Kimmel (Jimmy Kimmel Live) did not come to play as he delivered – and landed – jokes on the many topics affecting the world (Donald Trump) and the industry as a whole (Inclusion, Diversity, etc). The big winner of the night was FX’s The People v. O.J. Simpson: American Crime Story which led the night with five wins. Stars Sarah Paulson (Marcia Clark) , Sterling K. Brown (Christopher Darden) and Courtney B. Vance (Johnny Cochran) all took home awards for the series. HBO’s Game of Thrones followed with three wins which included the biggest win that came for Best Drama Series. 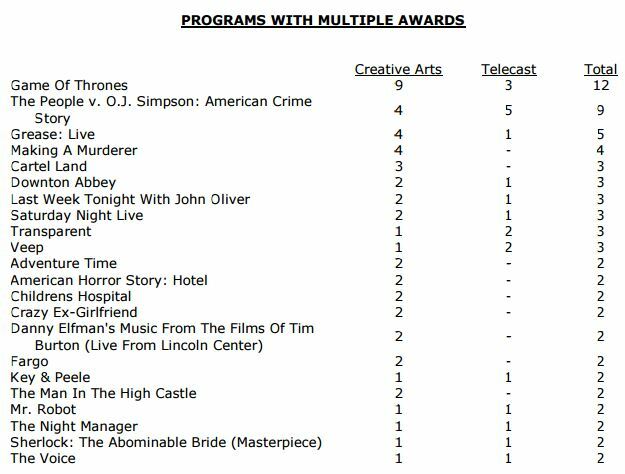 Below is a list of winners by program and network, the former including only shows that won multiple Emmys as well as the complete list of 2016 Emmy winners which include last week’s Creative Awards Emmy winners. It’s Your 50th Christmas, Charlie Brown! Another San Diego Comic-Con came to an end this Sunday and it came with so much TV news and trailers. 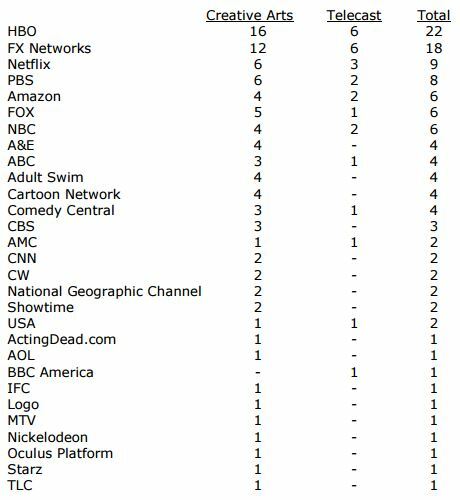 It seemed like TV was really the star of the con and for the first time overtook film at the big event. There were first looks at highly anticipated new series, teasers for upcoming seasons and news on some of our favorite long running series. Take a look at all the trailers and enjoy. FX’s series Legion is a new X-Men series from Marvel that had its coming out party at Comic-Com this weekend with the release of its first trailer. The series is an origin story of David Haller, who comic book fans know as the mutant Legion. The series will premiere some time in 2017. In this week’s episode, Emma and I chat a little about upfronts from her perspective and chat about episode two of Fox’s new reality dating series Coupled and the season premiere of ABC’s The Bachelorette. Next up to bat is ABC. There weren’t many surprises in the schedule as they have a pretty stable crop of returning shows with only a few cancellations.